Ireland claimed their second win in a row with a 35-12 victory over Wales with flanker Claire Molloy once again inspiring her team with a superb performance which included a brace of tries. Molloy was Ireland's captain until new coach Adam Griggs went for a fresh face in Ciara Griffin - another backrow who has impressed for Ireland - but if Molloy isn't technically the side's skipper, she is undoubtedly the player leading from the front for the Irish. Her two tries capped another brilliant performance, full of turnovers and outstanding defence and without her it might have been a different story for a Welsh side who failed to take numerous chances when they were in possession. Wales started brightly with Elinor Snowsill showing great control at 10 and finding her side plenty of territory with some excellent pinpoint kicking. But the visitors were guilty of too many handling errors and they gave Ireland time to recover and build into the game. Ireland scored from their first chance - when a driving lineout was well finished by Leah Lyons. Niamh Briggs converted and despite having had most of the possession, Wales were 7-0 down. Wales had more chances as the half wore on but the Irish defence did very well against some maul efforts in the Irish 22, with Molloy making the breakdown a lottery for the team in red. 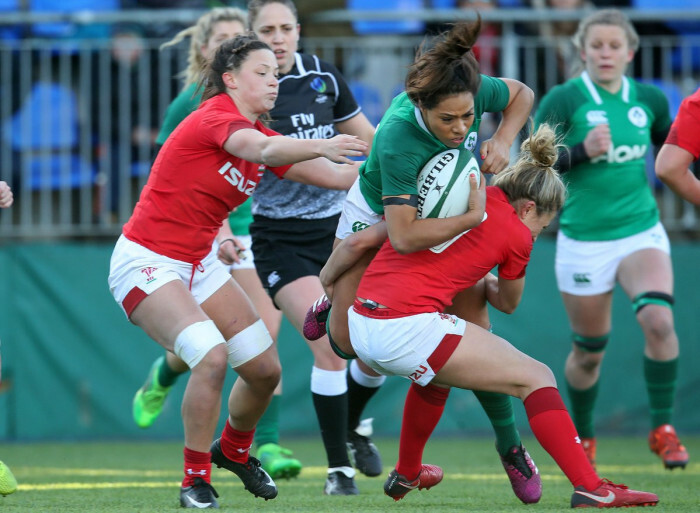 Ireland struck a killer blow just before the break when a brilliant break from Sene Naoupu tore through the heart of the Welsh defence and Molloy managed to dive over close to the posts. The conversion saw the hosts lead 14-0 at the break. Wales came out firing and were over for a try within minutes when Amy Evans powered over from close range after a neat driving lineout. Minutes later Sioned Harries crossed, after some poor Irish tackling with the number 8 skipping through numerous defenders. Lindsay Peat saw yellow because of a high tackle and at 14-12 Wales were well back in it. But Ireland came again, with a couple of huge hits from Lyons helping them win back momentum and Naoupu cut a sharp line to get Ireland back on the board again with a well finished try. Wales had plenty of chances, with Mel Clay and Jess Kavanagh-Williams with breaks in danger areas but Ireland did enough to hold them out with some well organised defence. Hannah Tyrell put the icing on the cake with a bonus point try in the final minutes and Molloy added the cherry on top with an athletic finish in the final minute. Ireland will now take confidence and momentum into their next home game against Scotland, a game they will surely be favourites to win. Wales will be kicking themselves when they watch the videos of all of the chances they blew - they had so many opportunities and these will make frustrating replays but they have positives too. Snowsill was in fine form and the entire Welsh backrow impressed again. A bit more cutting edge close to the line and this could have been a very different game. IRELAND WOMEN: Kim Flood (Railway Union/Leinster); Megan Williams (Old Belvedere/Leinster), Katie Fitzhenry (Blackrock/Leinster), Sene Naoupu (Old Belvedere/Leinster), Claire McLaughlin (Cooke/Ulster); Niamh Briggs (UL Bohemians/Munster), Ailsa Hughes (Railway Union/Leinster); Lindsay Peat (Railway Union/Leinster), Ciara O'Connor (Galwegians/Connacht), Leah Lyons (Highfield/Munster), Orla Fitzsimons (St. Mary's/Leinster), Nichola Fryday (Tullamore/Connacht), Ciara Griffin (UL Bohemians/Munster) (capt), Claire Molloy (Bristol/Connacht), Paula Fitzpatrick (St. Mary's/Leinster). Replacements: Cliodhna Moloney (Railway Union/Leinster), Laura Feely (Galweigians/Connacht), Fiona Reidy (UL Bohemians/Munster), Aoife McDermott (Railway Union/Leinster), Edel McMahon (Galwegians/Connacht), Nicole Cronin (UL Bohemians/Munster), Michelle Claffey (Blackrock/Leinster), Hannah Tyrrell (Old Belvedere/Leinster). WALES WOMEN: Lisa Neumann (Scarlets); Hannah Bluck (Cardiff Blues), Kerin Lake (Ospreys), Rebecca de Filippo (Dragons), Jess Kavanagh-Williams (RGC); Elinor Snowsill (Dragons), Rhiannon Parker (Cardiff Blues); Caryl Thomas (Scarlets), Carys Phillips (Ospreys) (capt), Amy Evans (Ospreys), Siwan Lillicrap (Ospreys), Mel Clay (Ospreys), Alisha Butchers (Scarlets), Beth Lewis (Scarlets), Sioned Harries (Scarlets). Replacements: Kelsey Jones (Ospreys), Cara Hope (Ospreys), Meg York (Dragons), Natalia John (Ospreys), Nia Elen Davies (Scarlets), Jade Knight (Scarlets), Robyn Wilkins (Ospreys), Hannah Jones (Scarlets).